Observation - miked's 239th spot submitted on 16th August 2009 - UK and Ireland. Description: whats going on here, found this fly on the ground in the forest, has it just emerged and waiting to dry off and pump up its wings? 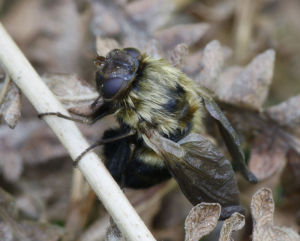 whats going on here, found this fly on the ground in the forest, has it just emerged and waiting to dry off and pump up its wings?